Published Feb 21, 2016 By Julia Leave a CommentThis post may contain affiliate links. 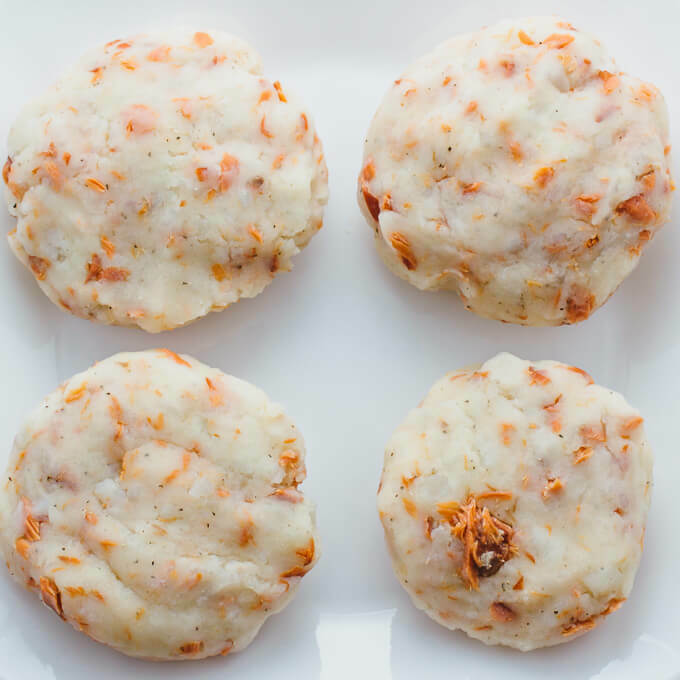 Amazing smoked salmon potato cakes: super crispy pan-seared exterior made of bread crumbs + smoked salmon and mashed potatoes interior. 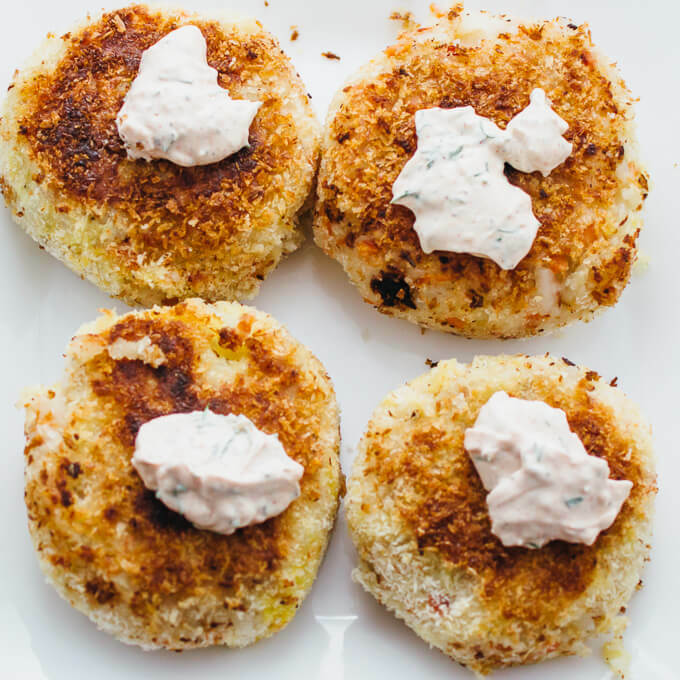 Best of all is the spicy dill-garlic dip for these bite-sized breakfast patties/pancakes! 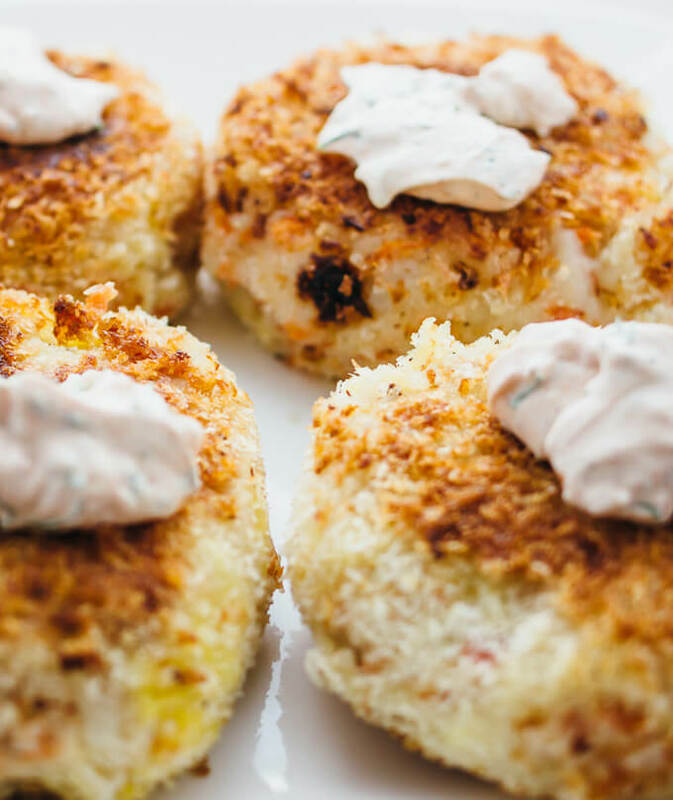 Back to these smoked salmon potato cakes (pancakes? patties?). These are SO addicting with the nice crisp exterior and the soft interior of mashed potatoes and smoked salmon. I could eat these all day. These are also REALLY EASY to make. First, you boil some potatoes. Second, you mash them. Third, you mix them with the smoked salmon. Fourth, you form the mixture into cakes. Anyone can make this using everyday tools that you already have in your kitchen. After you form everything into cakes, you use eggs and panko bread crumbs to give them that bread-y crunchy exterior, and then you’ll pan-sear them to perfection. You’ll want to eat these up immediately because they’re SO good right out of the pan. 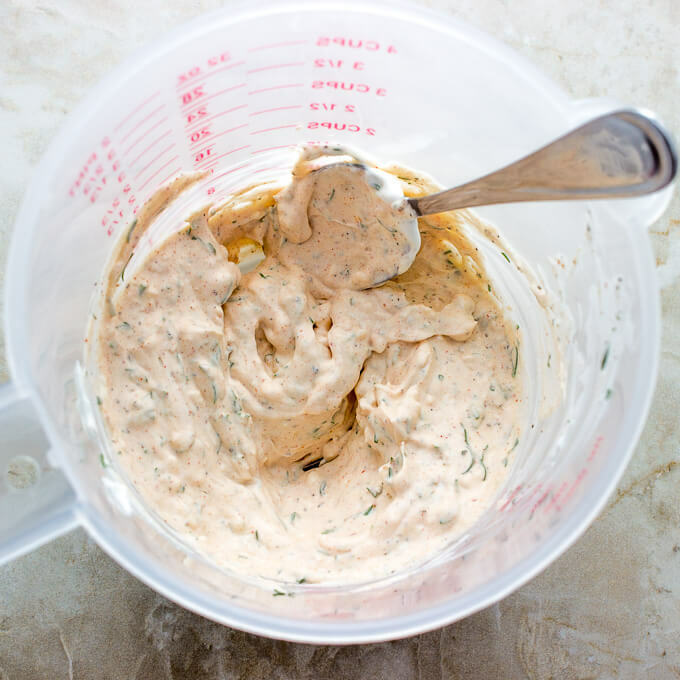 The dip is pretty simple to make as well. 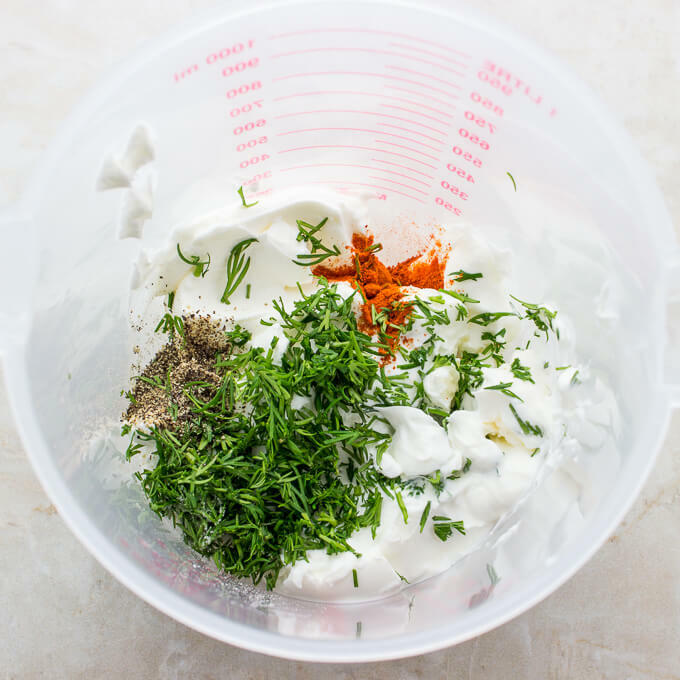 Mix some sour cream, dill, cayenne (YES GIVE ME SPICINESS), pepper, salt, and minced garlic. 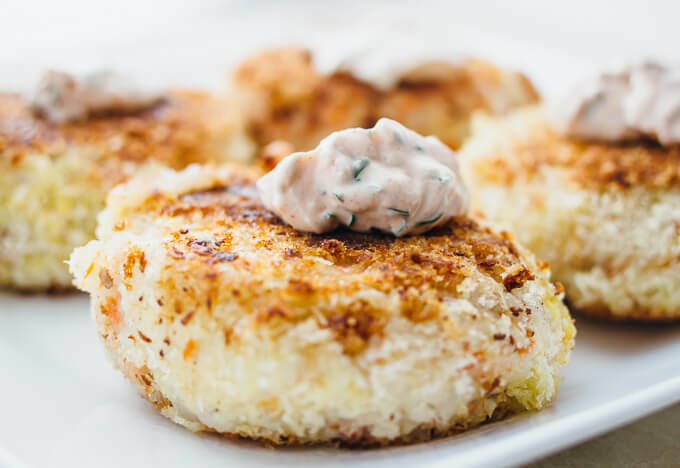 This smoked salmon potato cakes dish is great for any meal of the day — brunch, dinner, you name it! It’s easy to whip up a batch and refrigerate until you’re ready to pan-fry and serve them. Mix the dip ingredients together. Then let it sit in the refrigerator while you work on the cakes. Place the chopped potato chunks into a large pot. 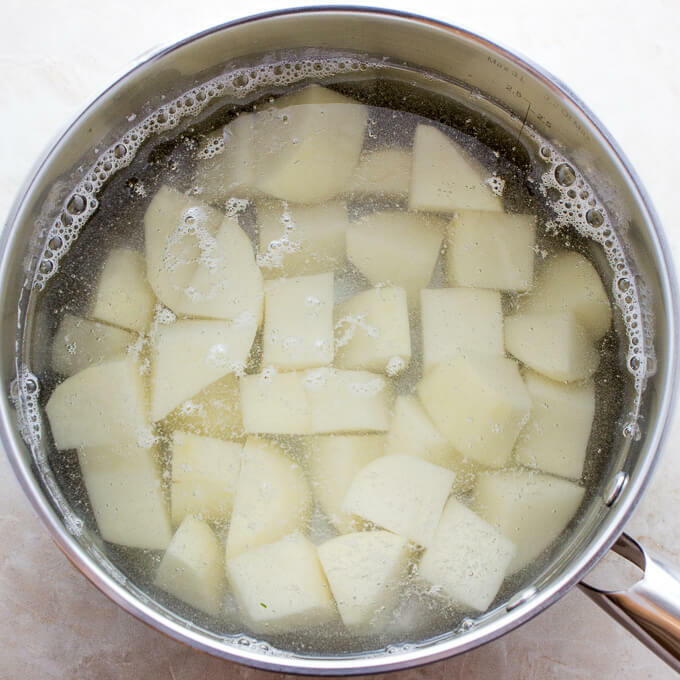 Pour water into the pot so that they cover about an inch above the potato chunks. Add salt. Place the pot on the stove and set the burner to medium-high. 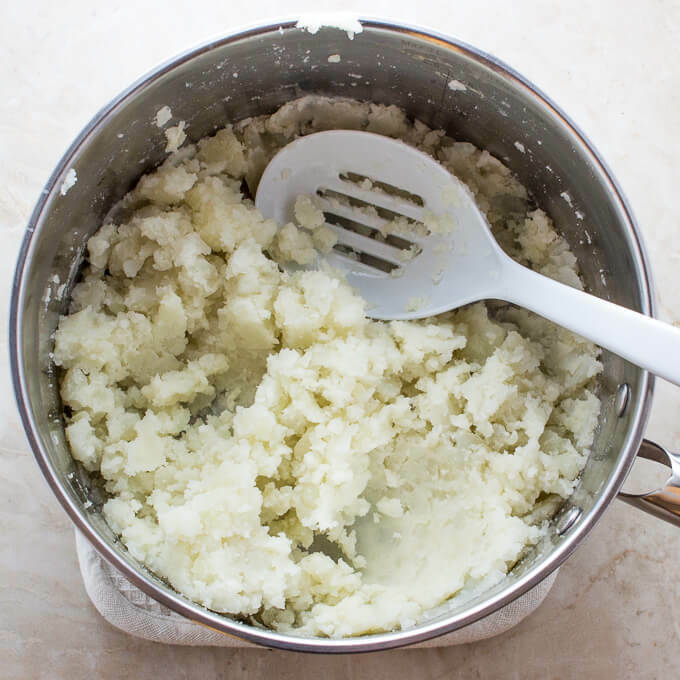 After the water starts boiling, it takes about 10 minutes until the potatoes are soft enough to mash. At that point, turn off the heat and thoroughly drain the potatoes. Mash the potatoes. Let the potatoes cool for 10 minutes or until cool enough to handle them. 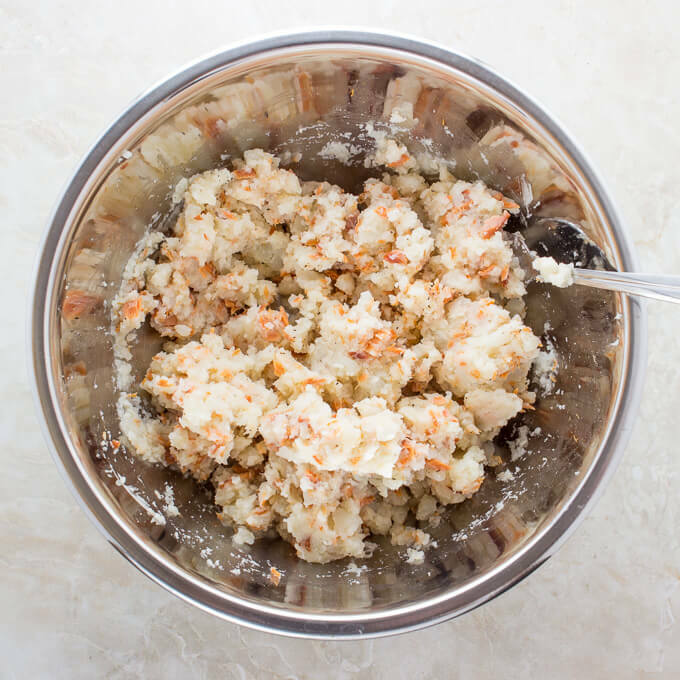 Using a large mixing bowl, add the mashed potatoes, smoked salmon, mayo, salt, and pepper. Mix well with a fork. Using your hands, form the mixture into 4 three-inch cakes. I found them to be easy enough to handle, but if they’re too soft for you, you can place them in the refrigerator for an hour to harden them a bit. Find two shallow dishes, and place a beaten egg in one and the panko crumbs in the other. Prepare a large pan with olive oil. Dip each cake into the egg and then the panko crumbs. Place them on the skillet over medium heat. Cook the cakes until they’re browned and crispy on both sides, about 8 minutes per side. Transfer them to a serving plate and scoop some dill garlic dip onto each cake.